For placement inside entrances for schools, shops, restaurants etc. 1. Download and fill out our order form below. 2. We will then contact you shortly with a colour proof of the mat and will not proceed with the manufacture until we have written confirmation (by fax, email or post). You may make as many amends as you like, with a £10 charge each time. 3. Once you are happy with the design and layout, we will deliver your custom logo mat and it'll be with you in 2-3 weeks. Can I cancel my order once the artwork for my mat has been produced? Yes you may cancel your order once the artwork has been produced, however you will still be charged the £35 artwork fee. Are Custom Logo Mats effective as dirt trapping entrance mats? Yes our Logo Mats are dual purpose, they can be used to announce and promote your brand or business and to keep your floors clean and dry at the same time. 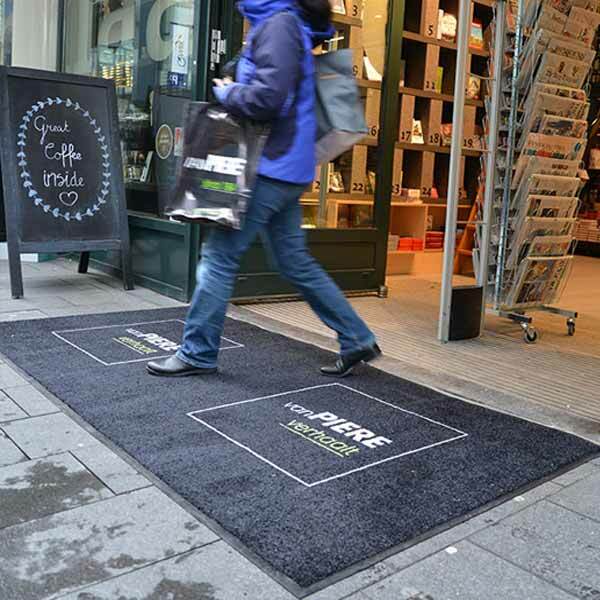 If laid out at the entrance of your premises the mat will absorb water and catch dirt effectively in light to medium foot traffic areas. Yes we offer price breaks on our Logo Mats if you order 2 or more, however if you have any additional queries about whether your order is eligible for a larger discount, please contact our sales team for an estimate. Do you offer custom sizes on your logo mats? Along with our range of standard sizes, we can also produce custom sized mats to meet your requirements, call 0800 1777 052 for help.